A new report discussed today in the New York Times, finds that about 13 percent of older adults (60+) say they are often lonely, while 30 percent say loneliness is sometimes an issue. This may have nothing to do with living alone; 62.5 percent of older adults who reported being lonely in this new study were married. And this may have very little to do with age; the suicide rates for older men are roughly the same as for teenage boys. Whether one is living alone or in a shared living situation, guarding against loneliness takes skill, reminds Steven Kurutz, writing for the New York Times. And cultivating this skill is important, because, if you don’t, there can be serious health consequences. In a culture where independence is the ultimate in maturity and success, more and more people are “going solo,” according to sociologist Eric Klinenberg. The surprising news Klinenberg unearthed is this: amidst the obsession with independence, singles work extra hard to be social. From what I have seen in my research, a good number of Americans in the 85+ age group are increasingly “aging in place” and thus living alone. And yet, despite what we might expect, they too have strategies to actively guard against loneliness. They cultivate daily routines that animate their days. They change it up here and there. They guard their privacy, and enjoy their social lives. One nonagenarian, Ann, volunteered for decades at a nursing home, pushing wheelchairs and making conversation. She probably thought “Someday I may end up there.” And she did. And she loved it, because they all knew her name. Another nonagenarian, Glenn, told his pastor he would like to share his home with someone who needs a place to live, for free. As of today, he is currently on his second boarder. The first was a single mother and kindergarten teacher. The second is a struggling actor. And then there’s Johanna, a centenarian who loves sitting on her porch, who soon become friendly with all of her neighbors. One day, she called a neighbor and asked if he wouldn’t mind taking her to the furniture store. “I’m tired of looking at my old couch; I need a new one.” And so they took an afternoon to go furniture shopping together. There are myriad ways to cope with loneliness. I learned this, and the importance of time for oneself, from the elders I have followed for the last 5 years. But I also see how they crave human contact, as we all do. And they and others manage to create unique opportunities for contact – by starting informal coffee klatches, chatting at the gym, reaching out to neighbors, tweeting, enjoying doctors visits, or becoming a regular at a local diner. I have come to see that these strategies for connection are a key ingredient in their long, healthy, meaningful lives. It is okay to admit to loneliness. We all experience it, like my friend who feels this most intensely in a crowd. The question is, what do you do next? What are your strategies for connection? If you were to write your autobiography, what would the chapters be? This is one of my favorite questions to ask when doing a life history interview. The answer may clue you into a person’s guiding themes in life, whether it be romance, nature, family, or beyond. True, our lives and passions change; but some things stay the same. When I asked Alice this question, her chapters mostly had to do with education (e.g. primary school in downtown Albany, secondary education at St. Agnes, college years at UAlbany, graduate training at Radcliffe College and Columbia University, and then decades as head of libraries at UAlbany, with a short stint at Smith College). Indeed, education was a guiding theme in Alice’s life. It defined how she was shaped (her parents were educators), who she became, and how she lived her life. And when I met Alice in her late 80s, Alice was still prioritizing education. She listened to talk shows and books on tape, was a member of research and antiques clubs, visited with her former colleagues often, and sponsored a scholarship for future librarians in her name. For Alice, education intersected with other major themes in her life, particularly friendship. At 94, Alice was still doing what she always did – continuing her lifelong education. Eddie’s guiding themes include people and humor. After a hardscrabble childhood as a first-generation Italian immigrant, Eddie spent many decades working as an elevator operator at the state capitol. Today, Eddie is still greeting people and cracking jokes as a nonagenarian. He has become the informal “mayor” at his local community center, greeting the morning crowd with a twinkle in his eye. In contrast to Eddie, Lore has led a painful life. 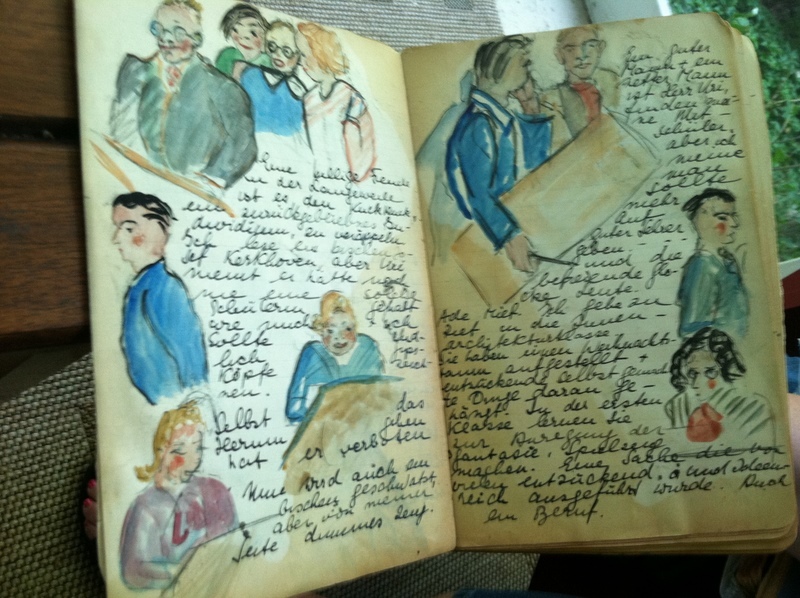 She has written the story of her life in her journals, and on those pages (see image above), she used watercolor painting and drawings to animate the hardship, and assuage the pain. As an adult she taught ceramics in New York City. And in her 80s and 90s, she took figure drawing classes. At 93, Lore’s paintings, drawings, and collages were shown publicly for the first time in a gallery near her home in Albany. A life’s artwork, laid bare. Lore’s guiding theme may have been tragedy; but creativity gave her an outlet, and a sense of purpose. A recent NYTimes piece told the story of Boyd Lee Dunlop, an aging musician. His piano playing in a nursing home brought him an opportunity to record a CD and headline a concert. 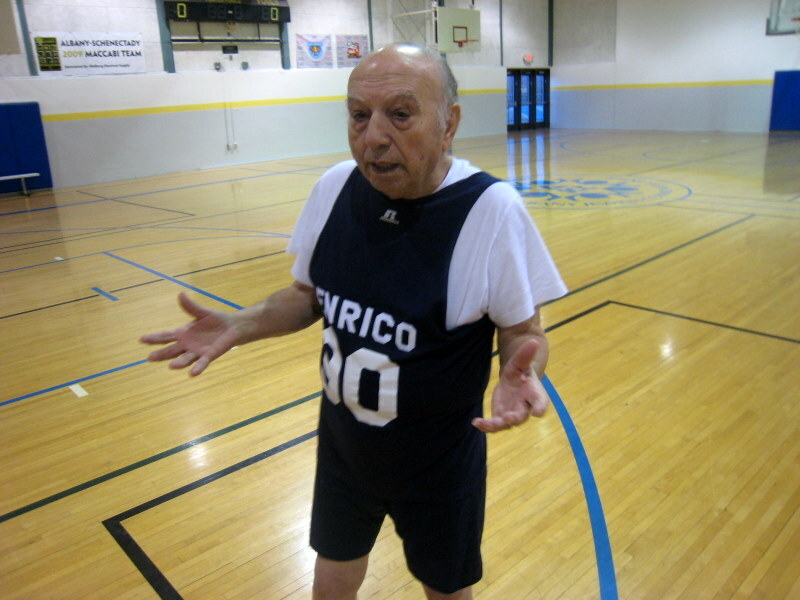 He’s still doing what he loves to do at 85. We all carry stories about who we are, where we come from, and what gives our lives purpose. In this way, we work at continuity across our lives. The elders I have come to know over the past five years have taught me this: we can nurture lives of purpose and meaning by doing what has always brought us joy. Is America Ready for More Old Men? Or so goes the title of the current debate in the opinion pages of the NYTimes. All of this hullabaloo comes out of a study that reports a narrowing gap between men and women in the 65+ category. While women tend to outnumber men in this age category, recent numbers show elder men catching up. Stephanie Coontz and Susan Jacoby seem to say, “hold on here,” let’s not forget that old women make up the current majority, and that’s not changing anytime soon! Currently 85 percent of centenarians are women, and women outnumber men by over 2:1 in the 85+ age group. Jane Gross reminds us that women have the lifelong resilience to make it to advanced old age. Sociologists like me call this social capital. Men, on the other hand, tend to have fewer friendships and social supports, and have depended on their wives to manage their domestic and social lives. To sum up: If manhood is changing, perhaps men will live longer lives. But it takes more than modern medicine to make that happen.